Catholic News World : #BreakingNews Thousands at Pro-Life March in Australia "Day of the Unborn Child"
#BreakingNews Thousands at Pro-Life March in Australia "Day of the Unborn Child"
Biggest turn-out ever at pro-life event in Sydney, Australia. Organisers of the annual Day of the Unborn Child in Sydney say yesterday’s turnout was the best they’ve had in 20 years of running the event. 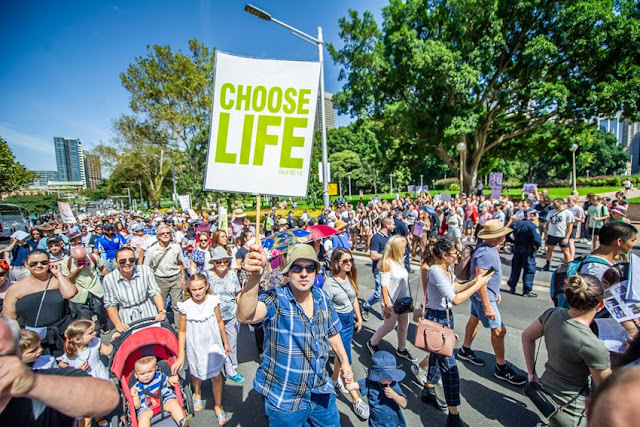 The pro-life procession, consisting of both young and old, including families with small children, made its way peacefully and prayerfully through the streets of Sydney’s CBD. The day began with Mass celebrated by Bishop Tony Randazzo at St Mary’s Cathedral. “Each and every time a human life is conceived, the child is a reminder of God’s love for his creation and we are reminded of his desire for our eternal life,” Bishop Randazzo said during his homily. “In the case of the innocent, vulnerable unborn child, our witness may literally save a life,” he reminded the congregation. Following recitation of the Angelus at 12pm, the procession led by Bishop Randazzo made its way to NSW Parliament House where lawyer Anna Walsh gave the keynote address. “The truth about the unborn child is that it exists as a unique human being, in time and space, and this truth holds when the child’s life is terminated through an abortion,” Ms Walsh said. The procession including both young and old, families and children, makes its way passed protesters in Hyde Park. After continuing down Martin Place, then along Elisabeth Street, the procession eventually made its way back to St Mary’s Cathedral where Benediction was celebrated. Day of the Unborn Child is a project of Life and Family Institute Pty. Ltd.